It seems a place ripe for wide use of ride-hailing apps that, you might think, would alleviate some of the congestion. Except, those apps appear to be making things worse as traffic has slowed in line with the growing popularity of apps such as Uber and Lyft, suggests a study by transport expert Bruce Schaller. Over the four years of the study, the number of cars in Manhattan seeking ride-hailing fares increased by 81%. There are now about 68,000 ride-sharing drivers across New York city. 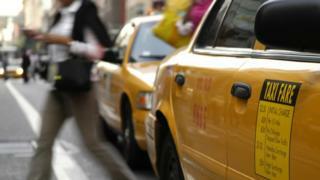 That's about five times the number of distinctive yellow cabs licensed to operate there, he found. There are so many, his work suggests, that they spend about 45% of their time empty just cruising for fares. That is a lot of unused cars clogging a lot of busy streets. Simple physics explains why such a glut of ride-sharing vehicles is causing, not curing, congestion, said Jarrett Walker, a public transport policy expert who has advised hundreds of cities about moving people. "Lots and lots of people are deciding that, 'Oh, public transport is just too much of a hassle this morning,' or whenever, which causes a shift in patronage from public transport to ride-sharing services," he told the BBC. "That means moving people from larger vehicles into smaller ones, which means more vehicles to move the same people. What is clear is that the current situation cannot continue, he said, adding that many urban authorities are keen to clear congestion. "I think we are going to continue to see stronger and stronger regulatory interventions to manage the impact of these companies." Data gathered about ride-sharing drivers illustrates how they contribute to congestion, said Prof Christo Wilson, a computer scientist at Northeastern University who has studied the services. "You can look at the traffic pattern for the Uber vehicles and it perfectly matches the peaks for the rush hour and the peak time of day," he said. "They are out there in force at the worst possible times." And, he said, the ability to summon a car via a smartphone app has other unforeseen consequences that are also thickening the jams. "It is increasing the total number of trips and these are discretionary trips that these people would not have taken if not for cheap, available ride-sharing," said Prof Wilson. "So, that is almost certainly increasing congestion." For their part, ride-sharing firms dispute the claim that they are the main cause of clogging the streets in the busiest cities. "Congestion is a really complicated issue," said Andrew Salzberg, head of Uber's transport policy. He says other factors at play include economic growth, road construction and the policies cities introduce to streamline traffic. "The number of drivers we have on the road is one of the easiest things to measure and that often becomes the focal point of the conversation," he said. And, he pointed out, it's not just taxis and private-car owners who are frustrated when they are stuck in motionless traffic. "We don't win as a company from congested conditions," he said. "Road conditions that make it impossible for people to get around are not good for our business." Mr Salzberg said it was also a mistake to think that Uber and other ride-sharing firms want to replace public transport. "We have come out many, many times and said, in the core of dense cities, there is no more efficient way to move people around than public transport," he said. The patronage of both ride-sharing services and public transport have a huge chance to grow substantially if people can be persuaded to do away with their own cars, said Mr Salzberg. Encouraging them to use buses, trams and trains as well as ride-hailing firms could ease traffic. For Uber, said Mr Salzberg, road-pricing is one good approach. As with London's congestion charge this would levy fees on people who drive themselves to an inner-city destination in their own car. Alongside this, he said, would go partnership schemes that pair public transport and ride-sharing. One such example of this was already operating in and around Innisfil in Ontario. This uses Uber cars to deliver people from their homes to central points where they then catch buses and trams to reach the centre of Toronto. Innisfil's local authority also subsidises Uber fares to ensure the system is attractive to those sections of the population who typically don't own a car, he said. There is a definite need to manage the changes that are rippling through cities as ride-sharing and autonomous cars develop and mature, said Carlo Ratti, a professor of urban technologies at MIT (Massachusetts Institute of Technology). In 2014, Prof Ratti demonstrated how smart routing and car-pooling could cut the amount of traffic needed to move people around cities by 80%. He stands by that prediction today but said work had to be done to soften the impact of those changes. Prof Ratti said studies had shown it would be "disastrous" to simply swap our existing system of high personal car ownership for one in which everyone owns a robot car that follows them around. Increased pollution, gridlock, a massive increase in urban sprawl and huge impacts on the transport industry would be the results if that scenario played out unchecked, he said. "It is imperative that we view these new technologies with a critical eye - and guide them toward the societal goals we desire," he said. "If we can manage the transition in a thoughtful way, self-driving cars could help us achieve a safer and more pleasant urban experience."